“When the mind talks, the body listen and acts accordingly”. How do we handle this ?. Everyone has an inner critic. You know, that tiny little voice that keeps saying things like, “you’re not good enough”, “you’re not smart enough”, or “you’re not pretty enough.” If you listen to your inner critic, you can end up suffering from depression, low self esteem, and anxiety. That’s because we take our own thoughts and critiques much more seriously than things that other people say to us. If someone tells you that you’re not very smart, you will likely ignore them. But if those doubts are coming from your own mind, you are far more liable to believe them. If you have a self-defeating thought, you can say: “Thank you for sharing” and move on with another one. Or you can say: “Stop it” and move on with a more positive. Whenever that little voice pops up, realize that you’re criticizing yourself and that all of those comments aren’t based in fact. For example, if you’re getting ready to take a test in your Advanced Biochemistry class, take a second to think about how irrational those comments from your inner critic are. After all, if you weren’t very smart, you wouldn’t be taking Advanced Biochemistry, now would you?. When you consciously realize that your inner critic isn’t acting rationally, it becomes easier to ignore. Every time your inner critic rears its ugly head, takes a second to acknowledge it. Then, make a conscious effort to ignore it. The only way to have a positive self-talk is becoming aware that you have this negative thought. Have you ever found yourself making a mistake and thinking: “I am a stupid. I will never get this right; there is no sense in keep trying”. If you have a healthy self-esteem, the first thing you would do is to become aware that you have the negative thought. You can change your negative self-talk with awareness. Listen to what you are saying. Change your self-talk and start to recognize your negative dialog, develop the habit of positive self-talk. Then, you will either stop it and move on, or you could talk back to that part of you that is defeating you. “Thank you for sharing, I know that I made a mistake, however, this is a good way to learn. Now that I know what I have done wrong I can try it again. To make a mistake does not mean that I am a mistake”. What does it want?. Why does it keep popping up?. You may discover that your inner critic has a very particular purpose. Some internal critics are there to make you feel guilty; others are there to keep you focused. If you know what’s driving your inner critic, it’s easier to defend against its attacks. Make a list of everything that your inner critic has done to interfere with your life. For example, if you never tried out for the cheerleading squad because you didn’t think you were pretty enough, write it down. Or, if you never went to Law School because your inner critic convinced you that you couldn’t handle the pressure, write it down. Once you have your list, accept what your inner critic has caused, and vow never to let it happen again. That way, you can move forward – without worrying that your inner critic is going to ruin other opportunities. It is crucial that get into the habit of not tolerating negative thinking. The dialogue that goes on inside your head all day has a commentary about everything you do and most of the time is negative. If you want to reach a state of bliss, then go beyond your ego and the internal dialogue. Make a decision to relinquish the need to control, the need to be approved, and the need to judge. Those are the three things the ego is doing all the time. It’s very important to be aware of them every time they come up. Deepak Chopra. Having a positive self-talk helps to build self-esteem and improve your confidence. 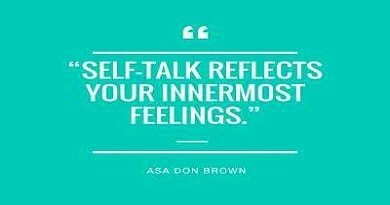 Your self esteem and confidence is influenced by the way you talk to yourself. Start to talk to yourself in a positive way. A healthy self esteem starts with awareness. Paying attention about your needs and goals. You are usually encouraged to ignore your own needs because you have to concentrate on living up to others expectations.